1,100 Russian Jews visit Auschwitz, hear about Polish rescue, betrayal of Jews. 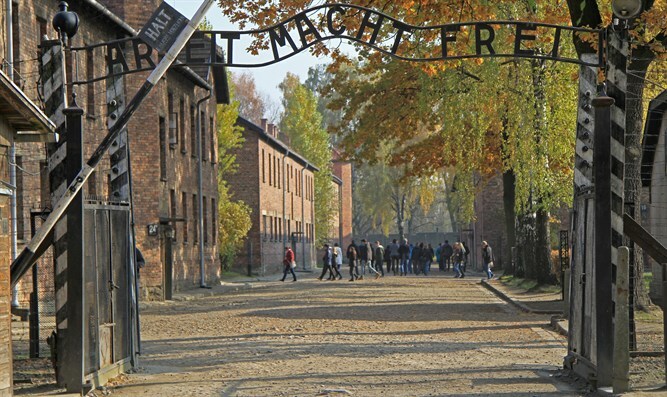 Russia’s main Jewish group is sending its largest delegation ever to the former Nazi death camp of Auschwitz in Poland, where participants will hear about Polish bravery and complicity in the Holocaust, a top rabbi from Moscow said. The Federation of Jewish Communities of Russia will send 1,100 teenagers and young adults to Auschwitz on April 30 as part of its annual Eurostars week-long trip, which brings Russian Jews to Western Europe, Federation President Alexander Boroda told JTA Wednesday. “It’s our largest delegation so far,” he noted. At the state-run museum, the participants of the program, which began in 2006, will learn about “the death machine” that the Nazis operated to kill approximately four million Jews at Auschwitz alone, said Boroda, a Chabad rabbi. They also will hear about the efforts of many Poles to save Jews from the genocide. But they also will be taught about “Polish traitors who betrayed Jews to the Nazis and helped the Nazis,” he said. Both rescue and betrayal, Boroda added, occurred in Poland on a larger scale than any other European country. The treatment of complicity by Poles in the Holocaust is a sensitive issue in Poland, further complicated by the passing of a law which criminalizes blaming “the Polish nation” for Nazi crimes, as the law states. The law cannot be allowed to affect Holocaust education, Boroda said. “No law can change the reality of what happened, and there is clear historical evidence of this, so we will not take such laws into consideration,” he said. The trip’s cost is approximately $1.2 million, donated by Russian-Jewish billionaire Roman Abramovich, Boroda said. “His impact on each Jewish community in Russia is unparalleled,” Boroda said of Abramovich. Before visiting Auschwitz, the participants will tour Jewish sites in Austria, the birthplace of Adolf Hitler. They will land there on April 30, the 73rd anniversary of the Nazi leader’s death by suicide. They also will visit Switzerland. On April 28, the city of Lviv in Ukraine will host a nationalist event where activists plan to parade in the uniform of a Nazi Waffen SS unit known as the 1st Galician, whose troops were mostly ethnic Ukrainians. In Latvia, veterans of another SS unit marched last month with hundreds of ultra-nationalists through the capital Riga, where the veterans march is an annual event.